Stefano practice Iyengar yoga since the end of the '90. He has participated in numerous workshops with senior teachers and advance in Europe as in India. He studied regularly at the Ramamani Iyengar Memorial Yoga Institute (RIMYI) in Pune, in the Iyengar Yogashraya and in Yogabhyasa in Mumbai, and in the School of Iyengar Yoga in Ravenna. 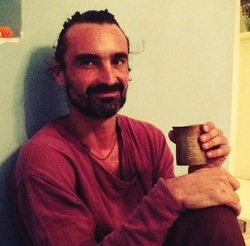 He started teaching in 2007, has been certified Iyengar Yoga in 2012. Mirja is a certified Iyengar™ Yoga teacher. Yoga found Mirja on her first trip to India in 2002 and she began teaching in 2011. Mirja’s approach to teaching is truthful, creative & intelligent. A dedicated daily practice of āsana, meditation and chanting and a deep trust in the power of the practices enable her to teach from the heart. Mirja teaches classes around London and continues to train in the Iyengar Yoga system with senior teachers Alaric Newcombe and Johanna Heckmann-Mohan. She regularly spends time in Rishikesh, India, where she studies with and assists Usha Devi at Omkarananda Patanjala Yoga Kendra. Mirja believes that to be a good teacher, you have to continue your journey as a student, consistently working on your practice and understanding, whilst learning from your teachers, your students and yourself. The certification process of Iyengar Yoga is considered the "gold standard" of the teaching credentials of Yoga. It is very rigorous, ensuring a well-trained instructor in the art, science and philosophy of Yoga. Prospective teachers confirm their dedication through years of study: at least 3 years as student + 3 years teacher training.